[value] => I have been wanting Mongolian pillows for awhile. The color is grey but it's more of a greyish taupe. I didn't want grey or taupe so the blend of the two is perfect for my sofa. I bought them to pair with very difficult to match pillows. They are excellent quality and ultra chic. [value] => This pillow is so elegant, so beautiful, I am absolutely in love with it. I have it on my couch and on my bed. [value] => Beautiful - Buy it! [value] => I have been thinking about getting Mongolian fur pillows for while. These were absolutely perfect. The color is off white which I feel is much prettier than if it were dyed to a bright white color. I also think the shade sold is more the "norm". If you purchase more than one, I would recommend purchasing from the store to ensure a good match. The reason being, some pillows are curlier than others, and some of the pillows have fur that is longer if it's less curly. I personally would not like to order online and receive a really curly one and a straighter one. The last reason you might want to go to the store to purchase is that some of the "white" pillows in the store had streaks of fur that were a light yellow. They had plenty of pillows and it was easy to find a pair that matched up well. Hope that helps! 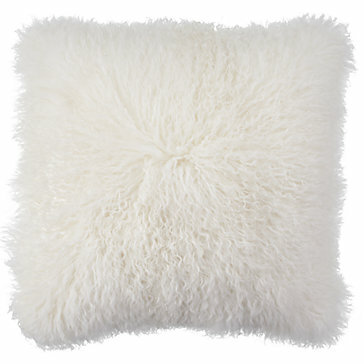 [value] => I never thought that I would pay $150 for a throw pillow, until I met this one. This pillow is the perfect size of fabulous and I love putting it on my bed. Can't wait to purchase a black one for my couch. Worth every penny, and I have zero regrets. I have been wanting Mongolian pillows for awhile. The color is grey but it's more of a greyish taupe. I didn't want grey or taupe so the blend of the two is perfect for my sofa. I bought them to pair with very difficult to match pillows. They are excellent quality and ultra chic. This pillow is so elegant, so beautiful, I am absolutely in love with it. I have it on my couch and on my bed. I have been thinking about getting Mongolian fur pillows for while. These were absolutely perfect. The color is off white which I feel is much prettier than if it were dyed to a bright white color. I also think the shade sold is more the "norm". If you purchase more than one, I would recommend purchasing from the store to ensure a good match. The reason being, some pillows are curlier than others, and some of the pillows have fur that is longer if it's less curly. I personally would not like to order online and receive a really curly one and a straighter one. The last reason you might want to go to the store to purchase is that some of the "white" pillows in the store had streaks of fur that were a light yellow. They had plenty of pillows and it was easy to find a pair that matched up well. Hope that helps! Show Less I have been thinking about getting Mongolian fur pillows for while. These were absolutely perfect. I never thought that I would pay $150 for a throw pillow, until I met this one. This pillow is the perfect size of fabulous and I love putting it on my bed. Can't wait to purchase a black one for my couch. Worth every penny, and I have zero regrets.